James Walker and Arthur Merryweather were half brothers who recorded for Atlanta record man and Chant label owner Bill Haney as Dino & Doc. After appearing at the door to audition with just a bass guitar and amp, Haney thought enough of their talents to organise a session at Fame Studios for them. 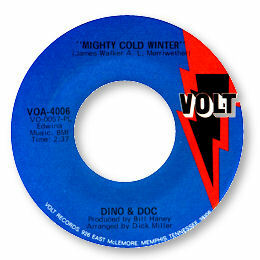 Two of the resulting tracks, with overdubbed horn charts, were leased to Jim Stewart at Stax, who issued Mighty cold winter and “A woman can’t do (what a man do)” on Volt. The top side is a catchy mid-paced tune and the flip is determedly funky but neither side got anywhere. With the reissuing of Haney's material by Ace UK several unissued titles by the duo were found. The pick of these is undoubtedly the lovely deep soul ballad A Hurt Girl - a classic piece of Muscle Shoals magic on which the duo’s lovely church based vocal styles sound just right. Note ~ You can find all of Dino & Doc's tracks on the two volumes of "Bill Haney's Atlanta Soul Brotherhood" (CDKEND 159 & CDKEND 192).